The deputy prime minister of Greece has warned that European Union suspicion of China is in danger of becoming a “self-fulfilling prophecy” while reaffirming his country’s support for Beijing’s controversial “Belt and Road Initiative”. In an exclusive interview with theSouth China Morning Post in Athens on Monday, Yannis Dragasakis said he hoped logic would prevail in the EU’s relationship with the world’s second-largest economy. “We would like to see the EU having good relations with China,” he said. Dragasakis was speaking ahead of the annual summit between the EU and China in Brussels on Wednesday, which this year will take place against a backdrop of suspicion among some EU countries over Beijing’s political and commercial ambitions in the region. Europe has been divided over whether to work with China’s enormous belt and road plan, which aims to link China by sea and land with southeast and central Asia, the Middle East, Europe and Africa, through an infrastructure network along the lines of the old Silk Road. 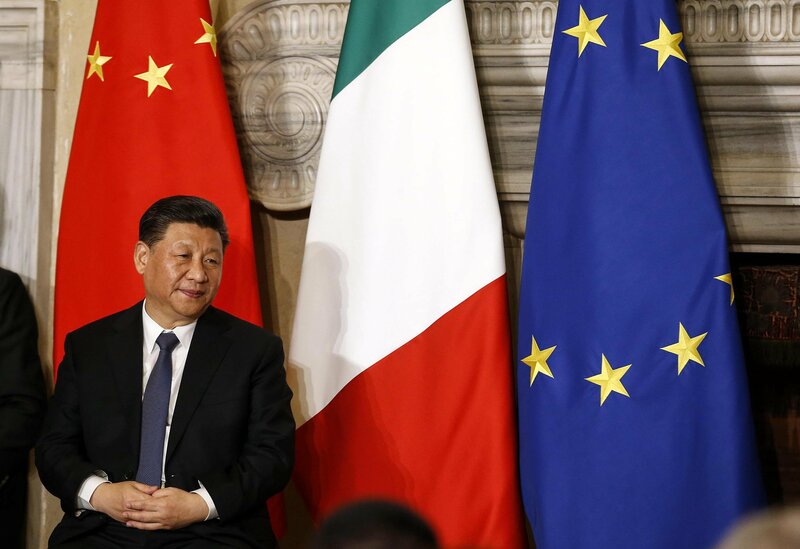 Washington has criticised the scheme as a “vanity project”, and the EU looks set to refer to China as a “strategic rival”, with some European leaders fearing Beijing’s diplomatic manoeuvres could derail unity among member states. Last month Italy, which is grappling with its third recession in a decade, became the first G7 nation to join the belt and road programme, in a bid to boost exports and upgrade its port facilities. Last year Greece – ranked second lowest in economic competitiveness within the EU by the World Economic Forum in 2018 – signed up to the scheme, after years of relying on China to help it through its own financial crisis. Chinese state-owned shipping company Cosco bought a 51 per cent stake in Pireaus Port, Greece’s most important infrastructure hub in 2016 with an option to buy another 16 per cent after five years. China aims to make the port the “dragon head” of its belt and road programme, serving as a gateway for its cargo to Europe and North Africa. Will Greece be China’s bridge to the rest of Europe? With its warming relationship with Beijing, Athens has, at times, departed from EU positions on China. In 2016, Greece helped stop the EU from issuing a unified statement against Chinese aggression in the South China Sea. The following year, Athens stopped the bloc from condemning China’s human rights record. Days later, it opposed tougher screening on China’s investments in Europe. Dragasakis was clear that the EU should not devise any policies that may hinder Greece’s ability to revive its economy. “Greece badly needs investment. We hope logic will prevail at the end of the day, which means we should take advantage of all opportunities and build on these prospects to further our collaboration,” he said. Dragasakis hit back at France and Germany for treating China as a geopolitical rival, while simultaneously signing up to trade agreements with Beijing. 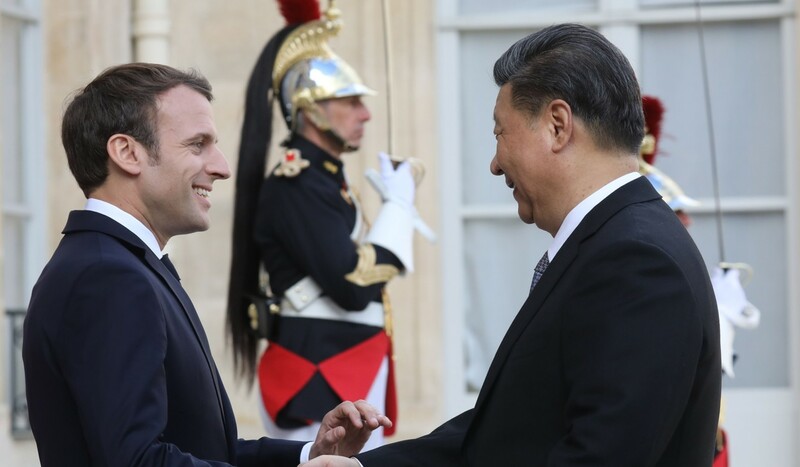 Days before receiving Chinese President Xi Jinping in France last month, President Emmanuel Macron declared that the “time of European naivety” towards China was over – a remark the Greek deputy prime minister described as “interesting” during the interview. “It’s so interesting, yes. Mr Macron, despite his statement, actually signed very large-scale agreements with China,” he said, adding: “Germany, the same”. 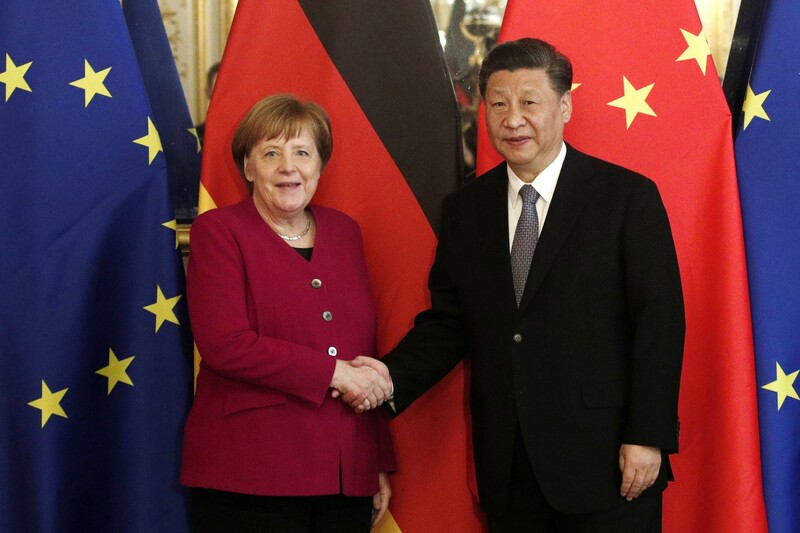 Macron invited German Chancellor Angela Merkel and European Commission President Jean-Claude Juncker to his meeting in Paris with Xi, where the four sought to reassure each other over economic cooperation between the European trading bloc and China. Dragasakis said Greece’s relations with China were based on “very solid ground” with the two countries sharing complementary interests, particularly through the belt and road plan. Greek Prime Minister Alexis Tsipras is understood to be considering joining Foreign Minister George Katrougalos at the belt and road summit in Beijing, which will be hosted by Xi later this month. More than 40 heads of state are expected to attend the summit, with China’s foreign ministry recently saying that Europe had started to see the value of the scheme. If confirmed, Tsipras’ presence at the summit will be interpreted as an attempt by Greece to consolidate Chinese support in the wake of Italy’s joining of the scheme. He will also need to mend ties with Beijing, following a recent decision by Greece’s archaeological body to block a plan by Cosco to upgrade facilities at the Piraeus port, throwing the future of the multimillion euro privatisation deal into uncertainty. Dragasakis said there were strong prospects for the future relationship between Greece and China because of the two countries’ reciprocal interest. Relations with other Asian countries, while not yet as close as Greek ties with China, would continue to be developed, he said. Dragasakis said Athens would not adopt discriminatory policies against any country as it looked to shore up foreign investments to boost its economy. India, for instance, has set its sights on Greece as a potential business partner, with President Ram Nath Kovind becoming its first titular head of state to visit Greece last year. “Relations with India are lagging behind – they are not at the same level as with China, but of course we are mulling further developments with India,” Dragasakis said, adding that Greece would also work more closely with Japan, South Korea and Vietnam. Beijing calls for ‘objective’ assessment of human rights record. China will hold a naval parade next month to mark the 70th anniversary of the founding of the People’s Liberation Army Navy and will invite more than a dozen of foreign navies to participate. The parade will take place on April 23 in the Yellow Sea off the coast of Qingdao in Shandong province, Ren Zhiqiang, a spokesman for the Ministry of National Defence, said on Thursday. Ren did not provide further details of the parade but military analysts said the exercise would give the navy the opportunity to display its rapidly growing strength and show how that has increased in the past 12 months. In April last year a naval review in the South China Sea featured a total of 48 vessels and 76 planes, including China’s first aircraft carrier, the Liaoning, its Type 094A and 095 nuclear submarines, 052D guided missile destroyers and J-15 fighter jets. The experts expect that next month’s event will provide a showcase for several new and more powerful vessels including its home-grown aircraft carrier Type 001A, the Type 055 – Asia’s most powerful destroyer – and several nuclear submarines. “The fact that China is holding the naval parade just one year after the South China Sea review shows the great importance [the leadership] attaches to the development of China’s maritime interests, the navy and its expansion,” navy expert Li Jie said. China also held a major naval parade in 2009 to mark the navy’s 60th anniversary. It was smaller in scale than the upcoming extravaganza with 25 PLA vessels and 31 fighter jets taking part. Fourteen foreign navies sent ships to the 2009 parade, including the USS Fitzgerald from America and the guided-missile cruiser Varyag from Russia. France, Australia, South Korea, India and Pakistan also joined in the event. More foreign countries are expected to join the party this year as the PLA has become more active internationally and China has sold more warships to foreign navies. “The parade is more like a birthday party for the PLA Navy and the participation of foreign navies is a matter of diplomatic courtesy with few military implications,” said Yue Gang, a former PLA colonel. Yue said the US and its allies would attend despite the rising tensions between the two sides. Since 2015 the US and Chinese navies have engaged in a series of confrontations in the South China Sea as China strengthens its military presence in the region and the US has sought to challenge Beijing’s claims to the waters by conducting what it describes as “freedom of navigation” operations. “I don’t expect they will send any of the warships that have taken part in such operations [to the parade],” Yue said. It has been reported that the Japanese Maritime Self-Defence Force has expressed an interest in joining the parade and the Philippines – which has a rival claim to the South China Sea – is planning to send a vessel to the event for the first time. Li said militaries such as the US and Japan would not want to miss the chance to observe the PLA Navy closely. “In addition, greater transparency [through the parade] will also help reassure smaller regional partners such as the Philippines that China is a friendly power despite its growing military strength,” he said. China held its first naval parade in 1957 and April’s display will be the sixth such event. Sailors also took part in the parade through Tiananmen Square to mark the foundation of the People’s Republic on October 1 1949. SEOUL (Reuters) – Samsung Electronics is pouring resources into its telecom network equipment business, aiming to capitalize on the security fears hobbling China’s Huawei, according to company officials and other industry executives. Those efforts include moving high-performing managers and numerous employees to the network division from its handset unit, two Samsung sources said. Potential customers are taking notice of Samsung’s efforts to reinvent itself as a top-tier supplier for 5G wireless networks and bridge a big gap with market leader Huawei and industry heavyweights Ericsson and Nokia. French carrier Orange’s chief technology officer, Mari-Noëlle Jégo-Laveissière, visited Japan last year and was impressed with the pace of 5G preparations using alternative equipment makers including Samsung, a company representative told Reuters. Orange, which operates in 27 markets and counts Huawei as its top equipment supplier, will run its first French 5G tests with Samsung this year. “Samsung is doing a big push in Europe at the moment,” one industry source said, declining to be identified. Underscoring the growing importance of the business, South Korean Prime Minister Lee Nak-yeon visited Samsung’s network division in January. In a closed-door meeting during that visit, Samsung heir Jay Y. Lee asked for government help with recruiting high-level engineers. Huawei is battling allegations by the United States and some other Western countries that its equipment could enable Chinese spying and should not be used in 5G networks, which will offer higher speeds and a host of new services. Australia and New Zealand have joined the United States in effectively barring Huawei from 5G, and many other countries, especially in Europe, are considering a ban. Huawei denies that its gear presents any security risk. Its woes have presented Samsung with a rare opportunity. Telecom firms would ordinarily stick with their 4G providers for 5G upgrades as they can use existing gear to minimize costs, but many firms may now be under political pressure to switch. “We’re bolstering our network business to seize market opportunities arising at a time when Huawei is the subject of warnings about security,” said one of the Samsung sources. The sources, who did not disclose specific figures for the employee moves, declined to be identified as they were not authorized to speak on the matter. Keen to seek new growth, particularly as sales of its mainstay chips and smartphones have begun to drop, Samsung plans to invest $22 billion in 5G mobile technology and other fields over three years. It declined to break down how much will go to 5G and the other areas – artificial intelligence, biopharma and automotive electronic parts. “Samsung is focused on building trust with our partners and leading the global 5G markets, regardless of other companies,” it said in an emailed statement to Reuters. Asked about Samsung’s big push into network equipment, Huawei said in a statement that it welcomed competition in the market. In India, Samsung is now in talks with Reliance Jio to upgrade its network to 5G, looking to build on what has perhaps been its biggest network success – becoming the key supplier for the upstart carrier. “We don’t think 5G is far away in India,” a Samsung official with direct knowledge of the matter told Reuters. He declined to be named due to the sensitivity of the matter. Samsung’s clients include U.S. firms AT&T Inc, Verizon Communications Inc and Sprint Corp and it has 5G network contracts with all three, though it was not clear how extensive those contracts are. It also sells to South Korean carriers and has partnered with Japanese mobile carriers to test its 5G equipment. In many cases, Samsung supplies only small pieces of networks. According to market tracker Dell’Oro Group, the South Korean firm holds just 3 percent of the global telecom infrastructure market compared with 28 percent for Huawei. Its network business made 870 billion won ($775 million) in operating profit last year, according to Eugene Investment & Securities. Filings show Nokia’s network business made about 1.2 billion euros ($1.4 billion) while Ericsson’s network operations made 19.4 billion Swedish crowns ($2.1 billion). Figures for Huawei were not available. One major hurdle for Samsung will be attracting talent amid a dearth of software engineers in South Korea. “We need more software engineers and want to work with the government to find that talent,” Lee was quoted as saying by government officials at his meeting with the prime minister. Samsung’s network business unit employs roughly 5,000 people, according to a government official in the southern city of Gumi where Samsung operates its manufacturing plants. Kim Young-woo, an analyst at SK Securities, expects Samsung to hire 1,000-1,500 people for 5G network equipment this year. Samsung declined to comment on network employee levels and hiring plans. But Samsung’s bet remains risky as the long-term nature of telecom network investment means change comes slowly. Sweden’s Ericsson and Finland’s Nokia, which acquired the remnants of once-powerful network equipment companies Alcatel-Lucent and Nortel, have as yet seen little sales growth from Huawei’s problems, company executives said. Both are in cost-cutting mode, even in the face of the 5G opportunity and the problems confronting their biggest rival. Indeed, some network operators in Europe are warning that a Huawei ban – now under consideration in France, the UK, Germany and other countries – could push back deployment of 5G by as much as three years. Others warn Samsung may struggle to develop a global sales and support organization. “The way telcos purchase products and services from their suppliers demand a lot of time and resources, which is why Ericsson and Nokia have around 100,000 employees and Huawei almost twice as many,” said Bengt Nordstrom, CEO of telecom consultancy Northstream. But Samsung is taking the long view. In December, it agreed to extend its Olympic partnership with the International Olympic Committee through to 2028 and expand its sponsorship to 5G technology. The company did not want to leave its sponsorship spot open to Chinese rivals, a separate source with knowledge of the matter said. LONDON (Reuters) – World shares and bond yields rode a renewed surge in risk appetite on Tuesday, as investors were optimistic about U.S.-China trade talks and cheered Washington’s deal to avoid another government shutdown. Tokyo’s Nikkei set the tone with its best day of the year so far and Europe wasted little time in trying to lift the STOXX 600 back to the two-month high it set last week. Germany’s DAX jumped more than 1.2 percent, after rising 1 percent on Monday, and Paris and Milan were up 0.8 percent, while London’s FTSE approached a four-month peak despite ongoing Brexit uncertainty. The dollar hovered at a two-month high and the Australian dollar also gained. The yen and Swiss franc dipped while U.S. Treasury and German bund yields edged up as investors jettisoned safe havens. “We have had two bits of relatively good news overnight – optimism about the U.S. shutdown not resuming and optimism about a trade deal,” said Societe Generale strategist Kit Juckes. Juckes said he reckoned there was now a 75 percent chance that a ratcheting up of U.S. tariffs on Chinese goods at the start of March will be avoided and a 95 percent chance that another U.S. government shutdown will be dodged. Those odds got a boost on Monday after U.S. lawmakers reached a tentative deal on border security funding, though aides cautioned that it did not contain the $5.7 billion President Donald Trump wants to build a wall on the Mexican border. S&P 500 e-mini futures were up nearly 0.5 percent, pointing to a solid start on Wall Street later after a choppy day on Monday. U.S. and Chinese officials expressed hopes the new round of talks, which began in Beijing on Monday, would bring them closer to easing their months-long trade war. “There will be no winner in a trade war. So at some point they will likely strike a deal,” said Mutsumi Kagawa, chief global strategist at Rakuten Securities in Tokyo. MSCI’s broadest index of Asia-Pacific shares outside Japan edged up 0.3 percent. Shanghai rose 0.35 percent, South Korea’s KOSPI climbed 0.6 percent and Australian shares gained 0.3 percent. The Nikkei rallied though, shooting up 2.6 percent after closing on Friday at its lowest level since early January. The Tokyo market was closed on Monday. With the yen backtracking again, shares of exporters such as automakers and machinery makers led the charge. Separately, Deutsche Bank noted it was 20 years since Japan cut interest rates to zero, something now standard in large parts of Europe. The dollar held firm, having gained for eight straight sessions against a basket of six major currencies until Monday, its longest rally in two years. Although the Federal Reserve’s dovish turn dented the dollar earlier this month, some analysts noted the U.S. currency still has the highest yield among major peers and that the Fed continues to shrink its balance sheet. “The dollar is the market’s pet currency at present regardless of whether concerns about the global economy are on the rise,” currency strategists at Commerzbank said in a note. The dollar popped up to a six-week high of 110.65 yen. In contrast, the euro dropped to as low as $1.1267, its weakest in 2-1/2 months, and last traded at $1.1277. In commodity markets, oil prices also ticked up as traders weighed support from OPEC-led supply restraint and a slowdown in the global economy. U.S. crude futures traded at $52.68 per barrel, up 0.5 percent. Brent crude rose 0.6 percent to $61.89 per barrel. Gold was a touch stronger at $1,312 an ounce. South Korea has voiced its frustration about repeated intrusions into its air defence identification zone by Chinese military aircraft, moves that analysts say reflect Beijing’s opposition to strengthening ties between Seoul, Tokyo and Washington. South Korean authorities said a Chinese plane, possibly a Shaanxi Y-9 electronic warfare and surveillance aircraft flew into the Korean zone Monday last week without notice. The plane entered near Socotra Rock in the Sea of Japan, or East Sea, at about 11am and flew out and into Japan’s air defence identification zone about 40 minutes later. The plane re-entered the South Korean air defence zone, near the southeastern city of Pohang, at about 12.43pm. Then it travelled up to South Korea’s Exclusive Economic Zone in the Sea of Japan, cutting between the South Korean mainland and Ulleung island. It was unusual for a Chinese aircraft to have taken that route. The plane was reported to have left the zone at 3.53pm. Air defence identification zones are not covered by any international treaty and it is standard practice to notify the country concerned before entering its airspace. The aircraft did not enter South Korean territorial airspace, which under the United Nations Convention on the Law of the Sea is defined as 12 nautical miles from shore. According to the South Korean Air Force, the number of Chinese military aircraft entering its identification zone is rising. In 2016, there were about 60 incursions, 70 in 2017 and 110 were reported up to September this year. Seoul called Du Nongyi, the Chinese military attaché to South Korea, to its defence ministry after Monday’s incident to expressed its “serious concerns” and called for “measures to prevent recurrences”. A middle-ranking South Korea Air Force officer said Seoul paid “extra attention” to the incident. Security analysts said the flights were a demonstration of China’s worries about increased US military activity in the region if US-North Korea negotiations failed. Sending military planes over area allowed China to extend its surveillance and sent a message that it was watching and, if necessary, willing to act to protect its interests in the region, analysts said. The US has sent military assets, including nuclear-capable B-52 bombers, to the Sea of Japan, prompting criticism from Beijing and Pyongyang. The US has long said North Korea’s behaviour was justification for joint military exercises with South Korea. These were stepped down this year to encourage Pyongyang at the negotiation table but could be stepped up again if talks on denuclearisation fail. “China’s moves are part of its grand strategy to exert greater influence, presence, and pressure in the Indo-Pacific region … Possible failure of US-North Korea negotiations would be in [Beijing’s] calculations,” said Ryo Hinata-Yamaguchi, a visiting professor at Pusan National University in South Korea and adjunct fellow at the Pacific Forum – a donor-funded, non-profit foreign policy research institute based in Honolulu, Hawaii. Zhao Tong, a fellow with the nuclear policy programme at the Carnegie-Tsinghua Centre for Global Policy in Beijing, said Monday’s overflight had several meanings. The resumption of US-South Korea drills and Japan’s recent military modernisation “would be viewed by China as a direct threat to its own security and the overfly of Chinese aircraft could be used to send a deterrence signal”. “Japan, in particular, is hosting increasingly advanced US military assets on its territory. 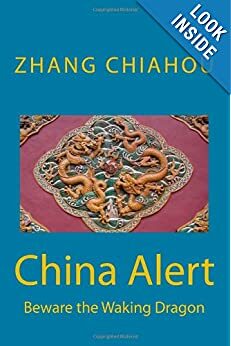 Chinese reconnaissance aircraft flying in the Sea of Japan can help it keep an eye on what is going on in that region,” Zhao said. Beijing fears the strengthening of an alliance network between the South Korea and Japan and, consequently, the completion of a US-South Korea-Japan triangle, often referred to as an Asian Nato. South Korea and Japan signed a military intelligence pact in 2016, which China criticised as a deal between countries that shared a “cold-war mentality”. “For China, the formation of a US-South Korea-Japan alliance triangle would be one of their biggest concerns as it would essentially be a powerful containment strategy against Beijing,” Hinata-Yamaguchi said. 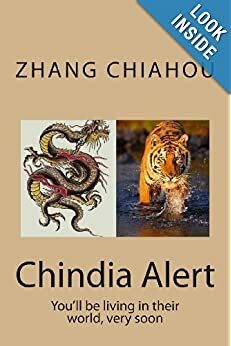 “China would take, and has taken, measures to avoid the formation of an US-South Korea-Japan alliance triangle, such as the [push for] ‘three positions’ promised between China and the South Korea in the autumn of 2017,” Hinata-Yamaguchi said. But Beijing played down the flight and called it a “routine arrangement”. Ren Guoqiang, spokesman at the Ministry of National Defence, said last week that Chinese forces were “in line with the international law and practice” and the South Korea side “didn’t have to be too surprised about it”. The ministry did not respond to requests for further comment.